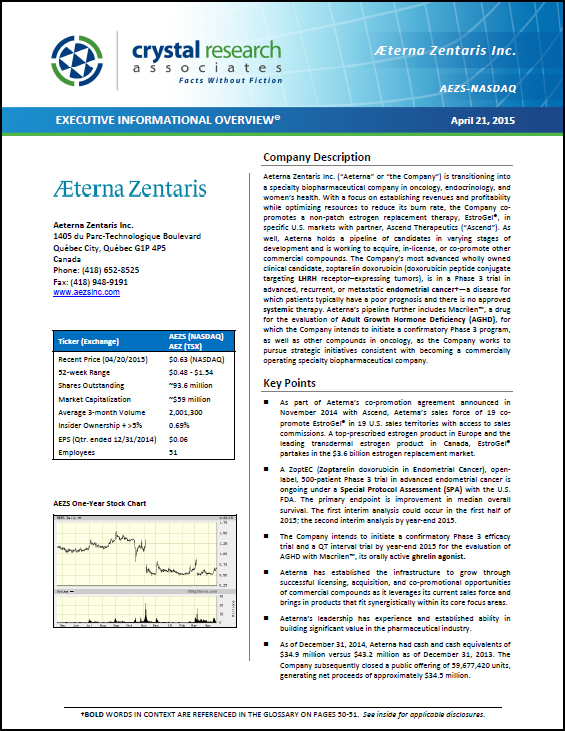 Crystal Research Associates has issued a comprehensive, 52-page Executive Informational Overview (EIO) on Aeterna Zentaris Inc. (AEZS-NASDAQ; AEZ-TSX). Aeterna Zentaris (“Aeterna” or “the Company”) is transitioning into a specialty biopharmaceutical company in oncology, endocrinology, and women’s health. With a focus on establishing revenues and profitability while optimizing resources to reduce its burn rate, the Company co-promotes a non-patch estrogen replacement therapy, EstroGel®, in specific U.S. markets with partner, Ascend Therapeutics (“Ascend”). As well, Aeterna holds a pipeline of candidates in varying stages of development and is working to acquire, in-license, or co-promote other commercial compounds. NEW RESEARCH: 56-page Executive Informational Overview Released on Juhl Energy, Inc. 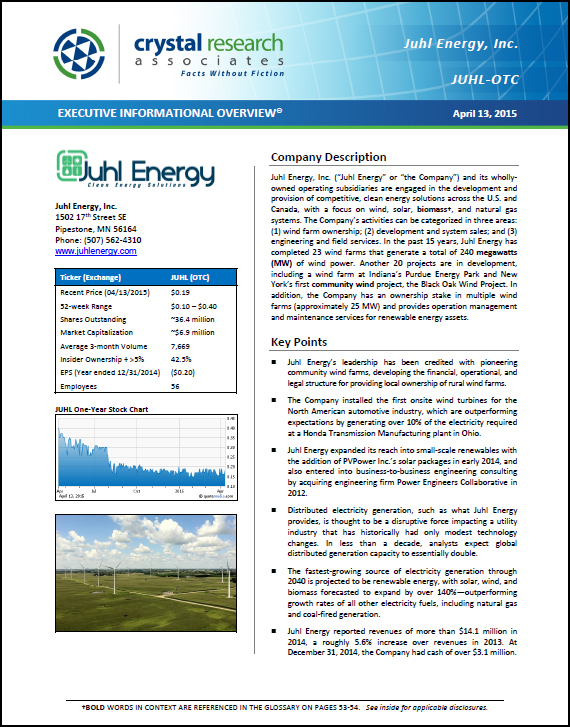 Crystal Research Associates has issued a 56-page Executive Informational Overview® (EIO) on Juhl Energy, Inc. (JUHL-OTC). Juhl Energy and its wholly-owned operating subsidiaries are engaged in the development and provision of competitive, clean energy solutions across the U.S. and Canada, with a focus on wind, solar, biomass, and natural gas systems. The Company’s activities can be categorized in three areas: (1) wind farm ownership; (2) development and system sales; and (3) engineering and field services. In the past 15 years, Juhl Energy has completed 23 wind farms that generate a total of 240 megawatts (MW) of wind power. Another 20 projects are in development, including a wind farm at Indiana’s Purdue Energy Park and New York’s first community wind project, the Black Oak Wind Project. In addition, the Company has an ownership stake in multiple wind farms (approximately 25 MW) and provides operation management and maintenance services for renewable energy assets.